After that, we keep whittling it down until we agree which story caught took us by surprise the most. 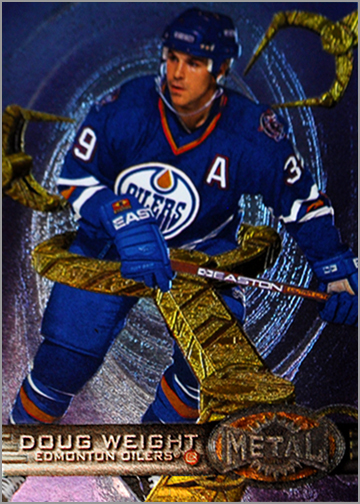 Twenty years ago, one of the most over-the-top hockey card sets was unleashed on unsuspecting collectors. 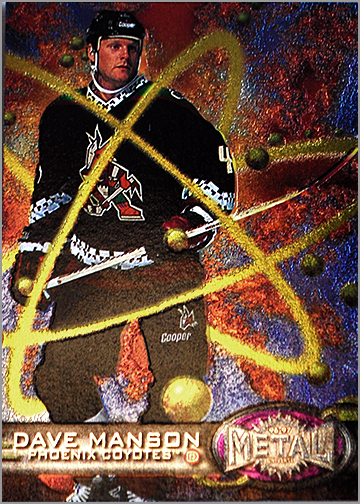 Of course, we are talking about the Fleer Metal Universe set from 1996-97, which superimposed hockey players into weird cosmic settings. 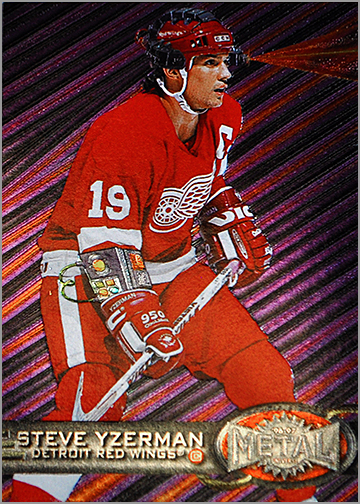 Ever want to see Theoren Fleury on an alien planet with giant flowers, Felix Potvin catching an exploding puck, Dave Manson at the nucleus of an atom or Steve Yzerman with a frickin’ laser on his head? If you said “Yes!” to any of those, well then, this is the set for you. Podcast #14 is 36 minutes long and features rockin’ new intro music by Jim “Not the Goalie” Howard. Here are some of the cards that we talk about. 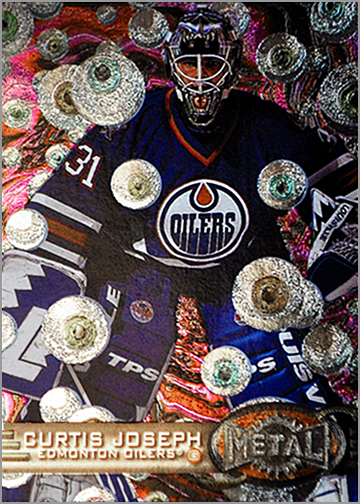 Curtis Joseph fighting off a swarm of flying eyeballs. Dave Manson at the nucleus of an atom (or about to go nuclear!). Steve Yzerman after being assimilated by the Borg. 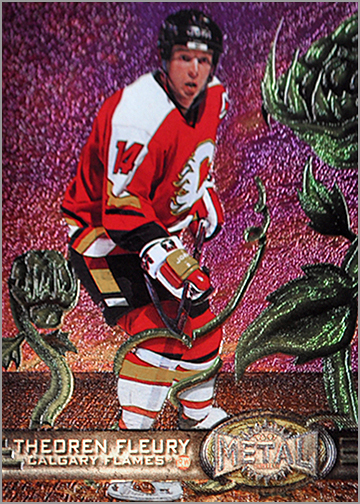 Theoren Fleury skating through a flower garden on an alien planet. Doug Weight being attacked by metal claws! Extreme! Sandis Ozolinsh impersonating the Kool-Aid Man. OH YEAH! Roman Vopat emerging from a Stargate. 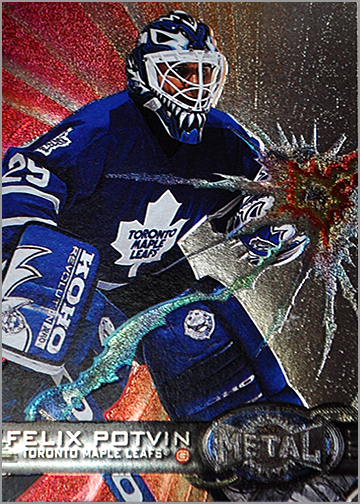 Felix Potvin catching an exploding hand grenade. Two more cards that we don’t talk about, but are still fun to look at. 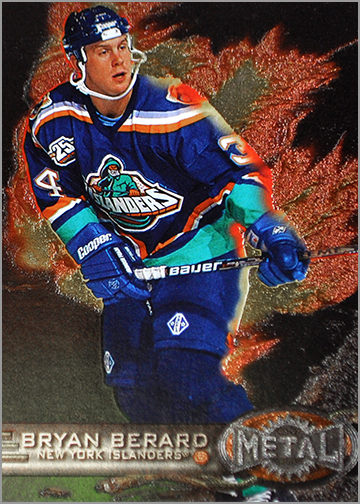 Bryan Berard hated his “fish sticks” Islanders jersey so much that he set it on fire. Unfortunately, he forgot to take it off first. Steve Rucchin shattering a metal wall with a bruising body check. 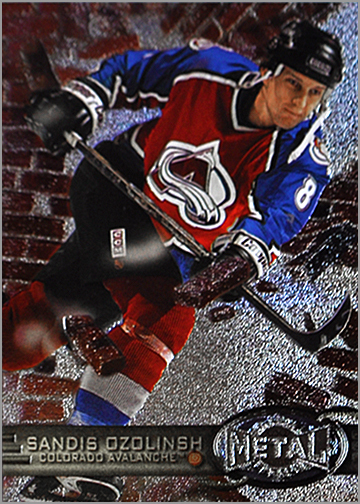 This may be the most “1990s” card ever made because it features a player who was only in the NHL because the league expanded like crazy, wearing a third jersey, on a shiny metallic trading card. …with your hosts, Sal Barry and Tim Parish. Also, since 13 is allegedly an unlucky number, there were a few audio glitches in this recording. 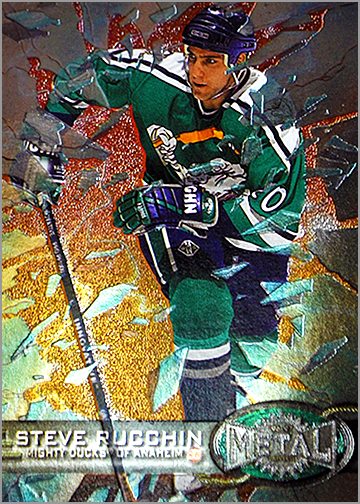 Still, it is a fun listen, as we look back at the past decade of O-Pee-Chee cards. Total Time is 38 minutes. In Puck Junk Podcast #12, Sal Barry and Tim Parish discuss the Subban-Weber trade, some of the Blackhawks’ free agent signings, the upcoming Chicago Blackhawks Convention and the problem with Case Breaks. Total Time is 1 hour 6 minutes, so get comfy before you hit play! It’s long overdue, but Puck Junk Podcast #11 is finally here. In today’s episode, Tim and Sal talk about the Pittsburgh Penguins’ Stanley Cup Championship — on Tim’s insistence, of course. Then they go retro and talk about the 1990-91 Upper Deck Hockey set. Player not working? Listen to the podcast on SoundClloud. Total time is 39 minutes, so get comfy! Total time is 35 minutes, so grab a doughnut, hit play and enjoy! In Puck Junk Podcast #8, Sal (@PuckJunk) and Tim (@TheRealDFG) talk about the upcoming 2015 National Sports Collectors Convention in Chicago, with a focus on hockey cards and collectibles. Topics include autograph guests, redemption sets, VIP sets and finding that diamond in the rough. Total time is 36 minutes 28 seconds. For more information about The National, visit their website here. Now that the NHL season is over, Sal (@PuckJunk) and Tim (@TheRealDFG) talk about one of their favorite sets of hockey cards: 1971-72 Topps (and O-Pee-Chee). 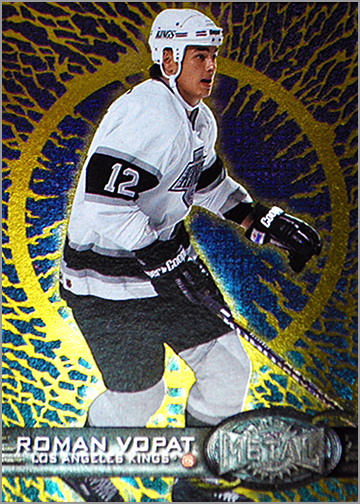 They also touch on the 2001-02 Topps Retro Hockey set, which used the 1971-72 design. Runtime is a (relatively short) 22 minutes. Pictures of the cards they discuss after the jump. Total time is 42 minutes, so hit play, make yourself a sandwich and enjoy!